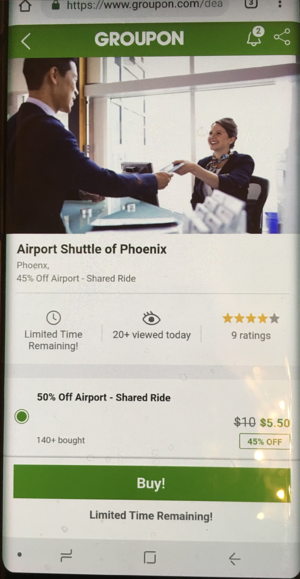 This Groupon for Airport Shuttle of Phoenix works just like a $10 gift certificate. You pay $5.50 and get about 50% off usable towards a shared ride. For example, your trip is $35 and you purchased the $10 Groupon. You pay $25 on your card and the Groupon pays the remaining $10. Your net savings is about $5 for using the Groupon. You can also use other discounts for round trips, veterans, AAA, etc. If you booked a round trip, you can purchase two Groupons. One for each one way trip. 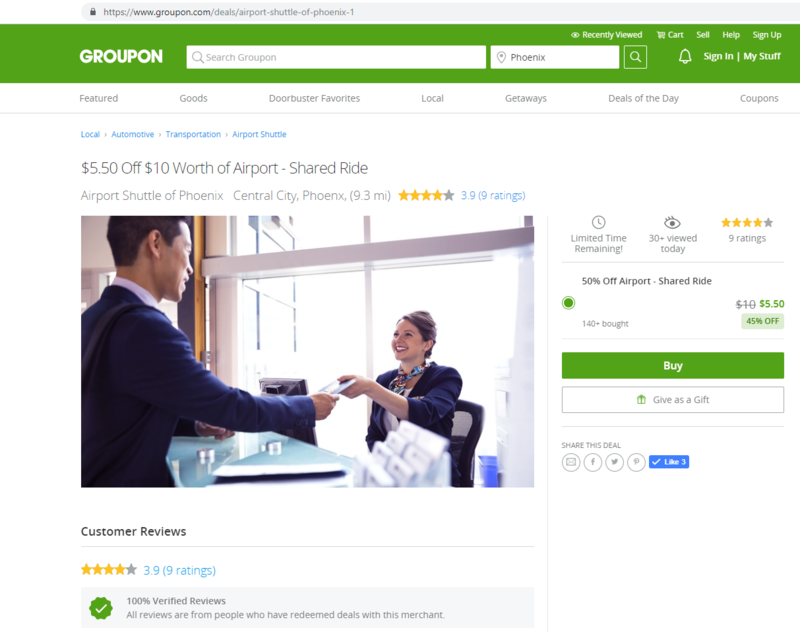 Groupons are applied to each trip, not individual passengers, so it's not a good idea to buy one for each passenger unless they all booked separately for some reason. Hope that explains it better. If you are not happy for any reason, Groupon can refund you directly. Groupon is a completely separate company, and we have very little or no control over the wording they use in their offers. Unlike many other merchants, we receive no compensation from Groupon in connection with their offers as of today. Most of our reviews on Groupon are very good and 5 stars. Did you know that 70% of all negative online reviews are written by competitors? This is a well know fact. Try Googling "70% of all negative online reviews are written by competitors". One negative review was from a customer complaining they couldn't reach someone on the phone right away. Assuming this person is not a competitor, the one and only dispatcher was on multiple calls with a different customers and called them back within an hour according to the review. Between 7 am and 8 am we typically get about 25 phone calls, so it's not always easy to call everyone back right away. If you need immediate assistance, you can always book online. 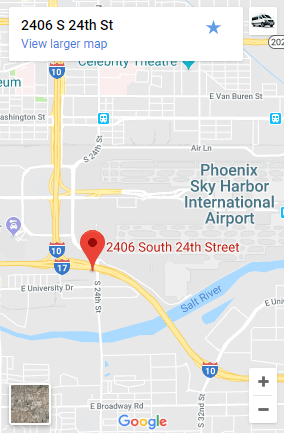 Drivers are usually very good about communicating directly with customers via phone or text when the customer is about to be picked up at the airport. The other one seems more suspect since the customer claimed the driver was complaining about her flight being late. We actually provide specialized training on what to say and what not to say to customers. Drivers are well aware that they will be fired immediately for complaining to customers or other types of inappropriate comments that violate our customer service policies. Even if this review is legitimate, I am almost 100% certain that driver no longer works for the company. It's common for customers to think that one experience or one driver is representative of every experience they will have in the future with the company, or the company as a whole; this is clearly an over-generalization. New drivers may seem good in the interview, but the real test is how they interact with customers over a long period of time.